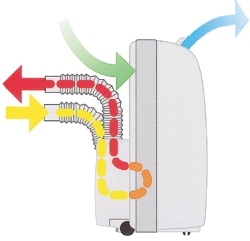 The DolceClima is the mobile air-conditioner with the highest efficiency. 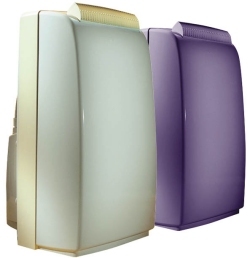 Design as a fixed conditioner, it optimises the condensor and evaporator circuits, giving high thermal efficiency. DolceClima provides the desired tempreature in less than 10 minutes, bringing the room temperature and R.H. to optimal levels. To start receiving cool comfort in just a few seconds (at a very low noise level of 39 decibels), all one needs to do is press the DolceClima's single button, which turns the unit on and automatically opens the grille.